As Vice Chancellor for Student Affairs, Judy Oliveira is responsible for campus-wide planning and policy formulation and ensures that student affairs programs, services and activities are aligned with the academic mission and strategic goals of UH West O‘ahu. Oliveira provides leadership for the delivery and administration of a full-range of student affairs programs including enrollment management, admissions, outreach, academic program advising, student orientation and registration, financial aid, activities, counseling, cultural advising, health and wellness, judicial affairs, first-year experience and retention, and career development. 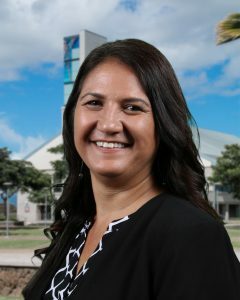 As a member of the university’s senior staff, she is responsible for overseeing the budget and material resources of the Student Affairs department and developing a comprehensive learning environment with a successful program of student retention that complements UH West O‘ahu’s strategic plan for recruitment and enrollment. Prior to joining UH West O‘ahu, Oliveira served as the interim vice chancellor for student affairs and as TRIO educational talent search director/principal investigator at Windward Community College where she managed five U.S. Department of Education grants, totaling over $4 million dollars, to improve college access and completion for low income, first generation and Native Hawaiian students. Oliveira’s education career began at Maryknoll School where she was a teacher for seven years. Oliveira holds a bachelor’s degree in elementary education from UH Mānoa, a master’s degree in curriculum and instruction from Gonzaga University, and a doctoral degree in educational leadership from the University of Southern California.